This year’s Tokyo International Antiquarian Book Fair attracted dealers, collectors and enthusiasts from around the world. But the undisputed star of the show was not books but a collection of nearly 850 maps of Japan and surrounding parts of Asia dating from 1522 to 1960, with 220 dating from before 1800. The Jason C Hubbard Collection is being sold by Daniel Crouch Rare Books, based in London’s St James’s, and has a price tag of ¥300 million. “Jason has been a long-standing friend and customer, and when he intimated to me last year that he wanted to sell the collection en bloc, I agreed to represent him”, Crouch told BCCJ ACUMEN. “He is a former executive of Polaroid who has spent more than 40 years building up the collection, and there are believed to be only 12 maps of Japan printed before 1800 that are not in the collection”, he said. 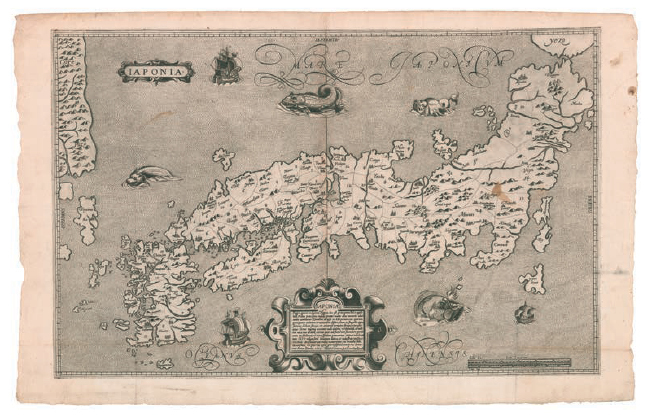 The collection includes the only known example of a map engraved by Christophoro Blancus and Inácio Moreira, dated 1617, that is a remarkably accurate rendering of the islands given the rudimentary equipment they would have been using. Also included is Engelbert Kaempfer’s book "The History of Japan," which includes a fold-out map, which was produced in London in 1727. “There has been a great deal of interest in the collection, although the problem is that, when you sell [collections] en bloc, a lot of serious collectors already have examples of a lot of the maps”, Crouch said. “A number are unique, and several others are very rare, but it is something that ought to be sold to an institution. “We do have several interested parties, but it is a lot of money, and state funding for purchases of this kind is becoming harder to come by. So, we are hoping for a philanthropic gesture to keep the collection together”, he confirmed. Daniel Crouch Rare Books was one of several specialist firms from the UK taking part in the book fair, held earlier this year at the Tokyo Traffic Hall in Yurakucho. The event coincided with a conference of the International League of Antiquarian Booksellers. “The antiquarian map market is thriving at the moment, and I think that might be because we are encountering cartography more in our everyday lives than we did, say, 100 years ago”, said Crouch. “People are travelling much more, maps are more accessible than they were and they also lend themselves to modern decorations and contemporary art”. The market for antiquarian books is a little more complicated at the moment, he said, with collectible items at the lower end of the market now being sold on the Internet rather than through specialist dealers. This means that books that were not long ago considered rare are now much easier to locate anywhere in the world and are, therefore, less rare. Pom Harrington, owner of Peter Harrington Limited, with its showroom on London’s Dover Street, was also in Tokyo for the event. It is the sixth time he has attended in the past 15 years. “In truth, the Tokyo event is a small affair”, Harrington said. “However, Japanese university libraries and institutions have been important buyers of Western rare books for many years now, so it’s an excellent chance to meet those clients and forge new relationships. “We sell throughout the year to Japan and use this as an opportunity to meet those customers who aren’t able to visit our London shops regularly—or at all”. According to Harrington, Japanese collectors were “huge buyers of rare books” during the peak years of the nation’s economic bubble in the 1970s and ’80s, with many valuable and much sought-after items finding their way to Japan. Now, however, there are increasing opportunities to buy some of those books back for the US and UK markets. Such books include classic works by Jane Austen, first editions of economics tomes and important private press books kept by William Morris, the English textile designer, poet, novelist, translator and socialist activist. Among the books that Harrington displayed in Tokyo were a first Kelmscott Press edition of Jane Austen as well as "The Works of Geoffrey Chaucer," dating from 1896 and one of only 425 copies on paper and still with its original cover boards. The book was priced at ¥9.1 million. And Harrington is upbeat about the state of the antiquarian books market in the UK. “Right now, we are finding the UK market to be strong”, he said. “We sell worldwide, and being in London is very helpful on that front because it is the centre of the profession. “There is an enviable quantity and quality of material going through London at the moment. The Antiquarian Booksellers Association has more than 200 members, and both professional booksellers and the major auction houses all see important book sales in any given year. “And the outlook is healthy”, he suggested. “There has been renewed interest in the printed book and the history of books. Auctions have been buoyant, and we are seeing a new, younger generation of book collectors. “The digital age has revitalised the book as a concept in itself and made it more interesting to a wider collectors’ audience”, he added.